These two images, put side by side, imply many things. Such implications go well beyond the fact that both use images to make a point about the state of a then-current war; that both a Norden Bomsight in operation. The manipulation of images here suggest implications for home living -- for the operative scale of what is at "stake" is rather broad -- from the single home, to a metropolitan region, to a nascent country. The suggestions can be literal. For example, the Nash Kelvinator ad (left) makes clear references to domestic living. The connection between the sighting a target through the bomsight and preserving American homes is all-too-palpable. The implications are also figural. 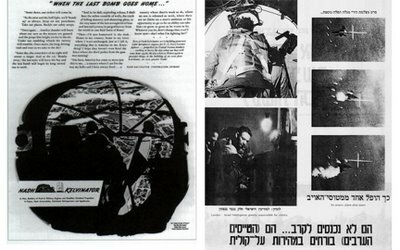 The second image (right), from Ha-milhamah le-shalom [Our war for peace], ed. Mahadurat Yediot Aharonot (Tel Aviv: Dekel, 1967) has more obvious political implications. In this instance, the sighting a target with a bombsight implies the protection and preservation of the still-young Israel.